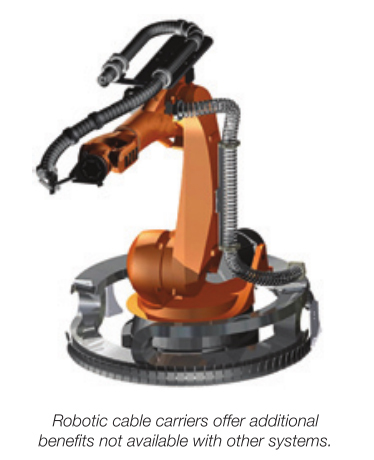 There are different options available for guiding and protecting cables on six-axis robots. Three well- known solutions include flexible tubing, enclosed dress packs and robotic cable carrier systems. In recent years, cable management has come into the limelight because machine reliability has increased dramatically, even though robots have grown more complex. Unfortunately, the methods used to attach and guide cables have not quite followed suit. While managing cables and hoses is often an afterthought in most designs, it is truly a vital part of any well-functioning robot. This is why the ways in which robot cables are attached and guided is important. The less is more approach to cable management is a best practice that robotics engineers and integrators can apply. It centers on designing cable management systems for six-axis robots – including cables, hoses, tubing, carriers, and connectors – in three separate sections. What do all these robots have in common? The cable management system is typically left to the last minute, but without it, unprotected cables are likely to fail. Cable damage can shut down the most important robot on the line, which leads to costly downtime. Current systems try to keep the cables on a six-axis robot static while everything operating around them is dynamic. Using one, long restrictive cable package prevents movement in sync with the robot. Restrictions stress cables, which accelerates failure. Often technicians severely bind cables with excessive dress packs (protective coverings on cables), cable ties, and even duct tape. The goal is to minimize tangling and interference with the machine, but these types of solutions cause corkscrewing and failure. Instead, consider a six-axis robot as three separate sections: the sixth to third axis; the third to second axis; and the second to first axis. This breakdown is the key to longer-lasting cables. Each cable section needs a minimal dress pack, strain relief with service loops, and a junction box that contains and protects the electrical connectors joining the cables. Use of a strain relief mechanism can eliminate stresses and extend the service life of a moving cable. This strain relief may consist of standard elements such as tie wrap plates or clamps. Engineers should ensure the cables are in the neutral axis, not touching the inner or outer radius of the cable management system. Strain relief cables on the moving end (sixth axis) with a one- to two-foot service loop. Protect cables and hoses with a modular, multi-axis cable carrier. Separate cables at the third axis and install a junction box for diagnostics and cable replacement. Strain relief cables on the third axis with a one- to two-foot service loop. Use a modular, multi-axis cable carrier. Separate cables and install a junction box at the second axis. Strain relief cables on the second axis with a one- to two-foot service loop. Multi-axis, reverse bend radius (RBR) cable carrier, protecting and guiding rotating cables. Separate cables and install a junction box at the first axis. Separating the dress pack into three shorter sections prevents it from wrapping, catching or snagging on machines and minimizes stress on cables and hoses. This approach applies to any six-axis robot, regardless of manufacturer or application. While other fixes such as duct tape and ties wraps might cost less and work temporarily, in the long run, properly designed dress packs reduce unnecessary downtime and maintenance costs. Six-axis robots can be found in applications such as robotics / automation, machine tools, handling machines, packaging machines, and many more. 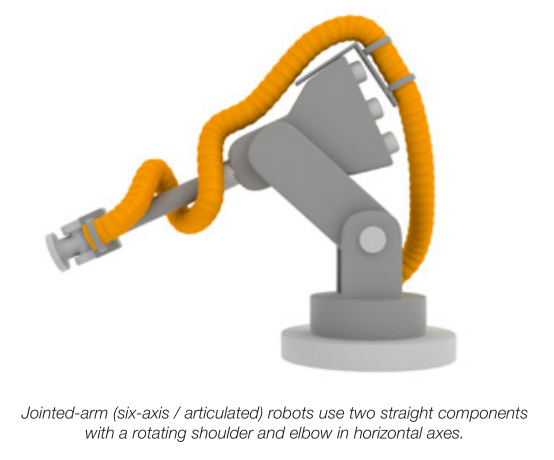 In addition to the appropriate dress pack, it is imperative that six-axis robots use dynamic cables specifically designed for continuous flexing. Two important features to take into account are a cable’s torsion-resistance and shielding. Shielded cables face a greater risk of failure because constant movements can easily compromise the cable jacket. Use unshielded, high-flex cables whenever possible to avoid problems. If this is not an option, turn to special “rolling-flex” cables. Corrugated- or flexible-tubing is one option for protecting cables on six-axis robots and is available in a wide range of sizes and styles. It has superior tear resistance at connection points and a long service life, even with reverse-bend cycles. 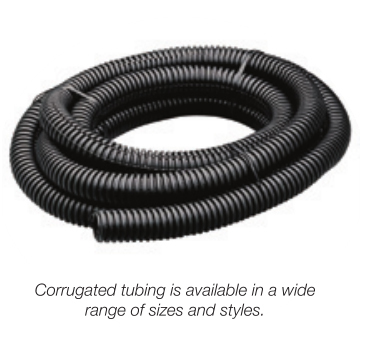 However, corrugated tubing has its limitations. It delivers minimal torsion resistance, and can only be fixed at two points with a defined length. The tubing can also stretch as the robot moves, which puts undue stress on the cables. Tooling interference sometimes occurs because there is no control path for movement. 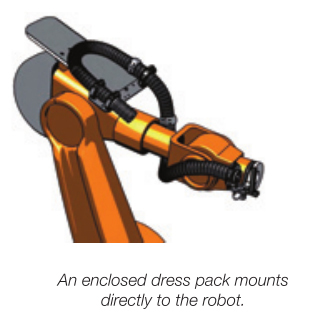 An enclosed dress pack mounts directly to the robot and is available in multiple configurations. It uses corrugated tubing installed inside a plastic-reinforced housing to protect cables. The system’s spring-loaded design minimizes catch and pinch points. Due to the completely enclosed housing, cable maintenance is difficult, and because it is not modular, the entire unit must be replaced if one component breaks. Problems can also arise if the programming or movements of the robot change. This is because an enclosed dress pack does not prevent the cables from exceeding their maximum bend radius. Robotic cable carrier systems are at the core of the less is more approach, and can be used universally for six-axis robots. The system mounts directly to the robot and is available in multiple configurations. Like an enclosed dress pack, it has a spring-loaded design, which minimizes catch and pinch points. However, robotic cable carriers offer additional benefits not available with other systems. They can come equipped with strain relief options to extend the service life of the cables; cables can also be quickly added or removed without dismantling the system. The defined bend radius of a robotic cable carrier protects cables from exceeding their maximum bend radius. The limitations of the system include minimal resistance to high-concentration acids and caustic chemicals, and the inability to handle circular movements with heavy loads. Robotic cable carriers are well suited for welding robots in tight areas, multiple-tool applications, material-handling jobs, and de-burring operations. For added flexibility, robotic cable carriers are available in a fully enclosed design, a pull-through design for easy cable access, or as a lightweight, low-cost system for applications that do not require cables to be completely enclosed. Total cable and hose diameters must not exceed 60 percent of the carrier diameter. Leave at least a 10 percent clearance between any two cables or hoses. Cables and hoses need to move freely inside the carrier. The less is more approach also eliminates some safety concerns within a robotics cell. Cables are able to move more freely, but are protected and guided properly so that they will not injure workers. Guide cables in one continuous path. Control the bend radius of cables to avoid pinching. Have the ability to quickly add or remove cables. Be available as a fully enclosed design for extremely harsh environments. 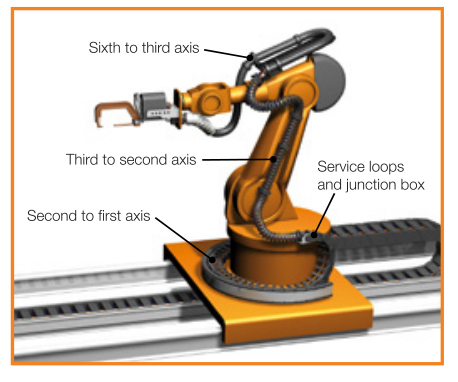 The Triflex ® RS robotic cable carrier system from igus ® was designed with the less is more approach in mind. It ships and installs as one piece and has an integrated fiber rod that returns cables to a home position after the robot completes a cycle. The system includes mounting plates and brackets, protection links, and a pre-engineered fiber-rod assembly. It is a modular, compact system, but with only one piece to install for complete end-of-arm tooling guidance. igus® develops products based on a belief in making functionally advanced, yet affordable plastic components and assemblies, including Energy Chain ® cable carriers, Chainflex ® continuous flex cables, and Triflex ® robotic cable carrier systems. No maintenance, lower costs, longer life cycles – these key principles apply to all igus ® products, systems and services. Tried and tested in terms of durability, friction properties and stability, igus ® plastics are the technological core of the company’s range.